Come ye thankful people come… this song echoes through my head at this time of year. When I was in grade school we sang it every fall…is this too much of a hymn for today’s schoolrooms? I hope not. Whether a traditional tune runs through your mind or not, at this time of year many of us turn toward thankfulness. A good thing, in and out of the garden. I think that gratitude is one of the keys to being a successful gardener, no matter what you are growing. When things are uncertain, as we all know gardening to be, it helps to focus on what goes right. When things are uncertain, as we all know life to be, it helps to focus on what goes right… and to be thankful. I’m so grateful for my new gardens, for Barack Obama’s election to the presidency and for the beautiful pheasant that pecks under the birdfeeder in my lakeside perennial bed. Thank you too for those showboat blue jays. Thank you for the pink muhley grass and the ‘Avalanche’ Calamagrostis in November. Thank you for my family and my friends. Thank you for the parsley and chives that still provide fresh herbs for my November dinners. Thank you for regular rain. When we express our gratitude for things large and small, we are uplifted. 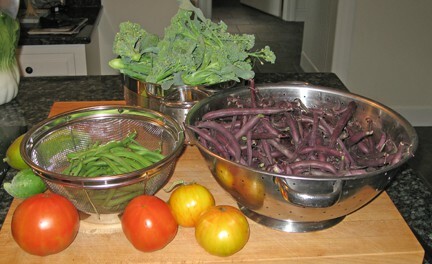 I am thankful that our first-year garden produced so well this season.